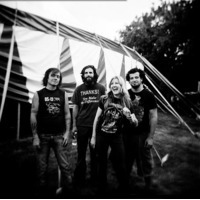 Kylesa is a metal band that was formed in Savannah, Georgia. Their music incorporates experimentalism with sludgy riffs, drop-tuned guitars and elements of psychedelic rock. The group was established in 2001 by the former members of Damad, with the addition of guitar player Laura Pleasants who is from North Carolina. The band has since undergone line up changes; the remaining original members are Phillip Cope and Laura Pleasants. In 2006, the band added two drummers (Carl McGinley of Unpersons, from Savannah, and Jeff Porter). Eric Hernandez (of Capsule, from Miami) joined in 2008 to replace Porter and plays on Static Tensions. The dual drum tracks are often panned strongly to the right and left, respectively, and create a rhythmic ambience.